Ms. Reel is a Director on the National Senior Campuses Board and serves on the NSC Operations and Risk Management Committee. She is also a member of the Community Relations Committee of Oak Crest Village and Riderwood Village. Ms. Reel is the Chief Information Officer for all divisions of the Johns Hopkins University and Health System. She was appointed Vice Provost for Information Technology and CIO for the Johns Hopkins University in January 1999. She is also Vice President for Information Services for Johns Hopkins Medicine, a post she has held since 1994. Ms. Reel is a member of HIMSS, CHIME, the Healthcare Advisory Council, the American College of Medical Informatics, and EDUCAUSE. She serves on the advisory board of Health Care Information. Ms. Reel graduated from the University of Maryland with a degree in information systems management and holds a M.B.A. from Loyola College in Maryland. Barbara Zorn is Director Living in Community (DLC) at Oak Crest Village (OCV). She retired in 1997 after 22 years with the Maryland Association of CPAs, Inc. As executive director, she led a diverse membership of nearly 10,000. Ms. Zorn adopted a team approach among the Board of Directors, staff and volunteers developing a strategic plan with challenging annual goals. Accomplishments included successful legislative results, quality and timely continuing professional education, and integration of technology into the profession. 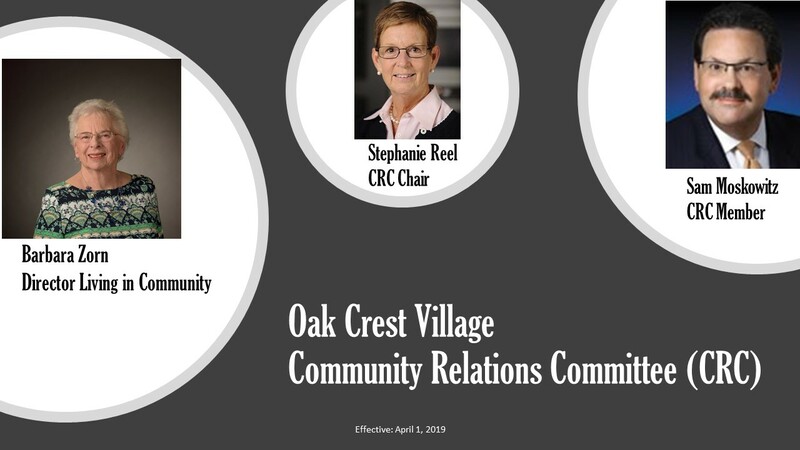 Since moving to Oak Crest Village in 2010, she has been an active volunteer, served a two-year term on the Resident Advisory Council as vice-chair and chair, and is co-founder of the various iPad Users groups. Ms. Zorn was appointed to the Oak Crest Village Board of Directors in 2015 and currently serves as Director Living in Community. She also serves as a member of the OCV Community Relations Committee and the OCV Audit Committee.